We were lucky enough to score a visit to Nintendo Australia's launch of Monster Hunter Tri on Cockatoo Island in Sydney Harbour. While there, we got a chance to play the new game, eat lots of food, and hear a few interesting things come up in conversation, none of which is to be taken as official, and currently only to be taken as rumour of course. We were greeted before getting on our ferry by a kindly fellow known as "Lord Turrock", a smartly dressed man decked out in chain mail and sneakers. Turrock stayed in medieval character throughout the night and greatly helped set the mood. 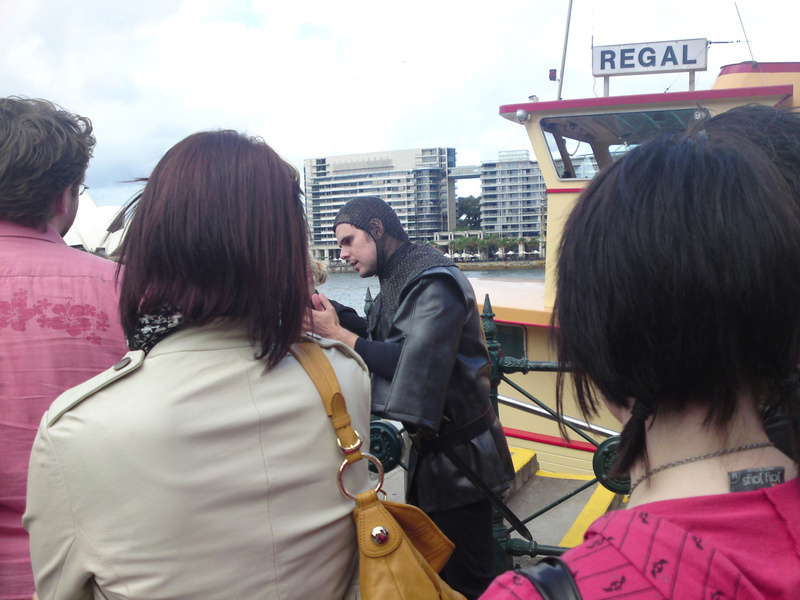 After arriving at Cockatoo Island, Turrock told us about one of the giant monsters from the game and how it ravaged his land, and then explained the different weapons available in the game and how they work. We were then led to a dark tunnel filled with swords, shields, skeletons and the like, further setting the mood of a medieval theme. Before we got to play the game, Nintendo PR Manager of Australia Heather Murphy announced the ship date and pricing for the Australian release before we got an explanation on how the game works from one of the other reps.
Now about the game, the build that was showcased appeared to be the same as the twenty-minute demo of the game that Gamestop are stocking: we had three different scenarios to choose from, the chance to take on giant monsters as a team of four and we also got the chance to play the two player split-screen arena mode. Classic Controller Pro was the preferred way to go with this game over the Wiimote and Nunchuk combination, and while some of the button combinations will take getting used to (hold down L while pressing Y and A to switch through items, put your weapon away, then press the same button again to use the weapon) it felt fine after a few minutes of play. 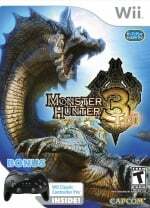 Camera control is a little funny, as you need to control that at all times as well as your character, and you'll find that you'll need to keep moving it to keep your hunted monster in your sights. Luke's impressions will give you more information on the game, as not much has changed since his play with the game. We had the chance to talk to a few of Nintendo Australia's reps at the event, where the subject of Sin & Punishment 2 was brought up. For now this is a rumour only, but it looks like the title's not headed over to Australian shores, and that its only chance may be if a third party picks it up, which is unlikely, being a Nintendo-owned property. We also got some information regarding the ability to transfer DSiWare from one DSi to another: we previously reported that you could get it transferred to another DSi only if your console is damaged. We've now heard a rumour that this can only happen now if the unit is still under warranty, as out of warranty repairs get sent to an official repairer off-site. Though as saddening as it was to hear those tidbits, the night was a fun experience overall, and shows that Nintendo are really committed to getting these games heard throughout the media, and have a lot of confidence in Monster Hunter. Lord Turrock announced at the end of the night that "we had all fought bravely and many of us died quickly" shortly before we all shouted "VICTORY!" and headed back to the mainland on the ferry. Sin & Punishment 2 not coming to Australia? /Dies! @WiiLovePeace: As I said, it was mentioned by a few people there, so it's only a rumor that's going through Australian media right now, but it wouldn't surprise me if sales of the N64 VC game didn't meet expectations. That sounds like it was a pretty cool time. I wasn't planning on buying this game, but have since decided it's worthy of some trade-in credit, though the controls sound a bit fidgety. Cockatoo Island. Why didn't I see it. @ChunkyDroid: Yeah that's true. It was rather expensive, I guess it wouldn't have sold well. But it's just so awesome!... Damn money taking priority over awesomeness haha. I guess only time shall tell if that rumour is true or not. Regarding DSiWare transfers, it seems sort of strange that they can't transfer out of warranty. Has anyone with an out of warranty Wii gotten their WW/VC games transferred (or at least the system information needed to download them)? I feel like that hasn't been an issue in the US at least. Is this a DSi thing or is it just another chance to screw over the poor Aussies? @token: it hasn't been an issue in the US, at least, because the DSi hasn't been out for more than a year yet. once everyone starts hitting the end of their warranties, then we'll see how they handle things, i guess. What kind of food was there? Did you guys get to eat any Kirin cheese or dragon head? Apparently it's because they're sent to the third party and they can't transfer them, that's all I heard anyway, it's not something I can completely confirm at this moment. Its not a problem in the US for the Wii. I recently had to send mine in for repair, and they had to replace the motherboard and disc drive in a 3 year old machine (launch system for me...yay). When I got it back, none of my VC/WiiWare games that were on my SD card would work, and I'm having to redownload them all from the Shop Channel. But, I still CAN download them again. The games (for the Wii in the US at least) appear to be locked to a particular Wii when downloaded, but the ability to download each one is locked to a particular account, not system. At least, that's how it looks to me. Haha, yeah, it was a great event, although the DSiWare thing really upset me. It was great to meet you, Chunky! Now Nintendo PR knows who you are, hopefully you get invited to all the events going forwards!